Summer is almost at the end and another month has passed quickly, normally August means violent storms , big waves and rain, This year as happen last year, we had some storm but not strong as usual. Sea was almost flat all time, few days with heavy rain but many more with sun shining and the breeze making very pleasant to stay on the beaches. 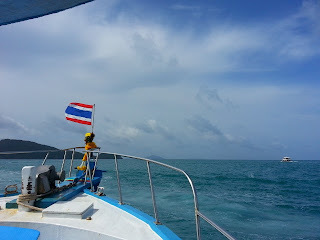 Have a look to our reports to have an idea how weather was during the days, specially if you are an holiday to Phuket in August. Boats and tours went our regularly, weather was good and hotels are cheap so every year now more and more people are coming to Phuket Island in July and August. few years ago I always suggested to just buy the airplane ticket and once here can decided where to stay. Now I suggest better book at least three nights stay to be sure you have the hotel you like in the place you like, then once here can see what is available. three to four stars hotels have been fully booked for many days, making sometime difficult for last minute arrivals to find a solution on line with needs. Also tours to popular destination are getting full so if looking to a private tour and custom made itinerary better plan in advance.